I’m not going to lie to you here. 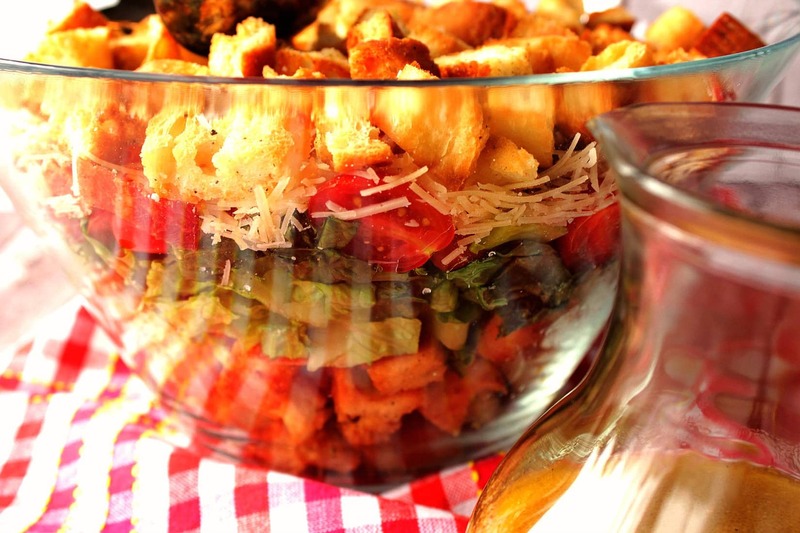 The thing that really puts this BLT Layered Salad over the top are the homemade croutons! Well, those and the bacon of course! If you’ve never made your own homemade croutons before I urge you to finally give it a go. The freshness, flavor, and crunch that a homemade crouton provides are about one million percent better than the prepackaged store-bought variety, and they hardly take any time (or effort) to make. I learned a few things while making this BLT Layered Salad that I need to share with you. 1. 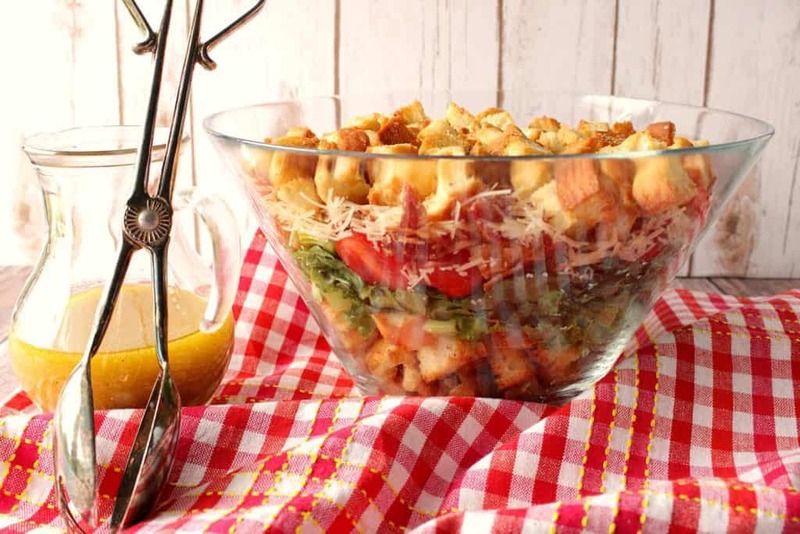 A large, clear glass bowl works best for viewing all the layers of bacon, lettuce, tomatoes, croutons, and Parmesan cheese. 2. A large, clear glass bowl is not the best when it comes to taking pictures due to glare and reflection. Drats. 3. Make sure you prepare double the croutons that you think you’ll need because you’ll be snacking on them all throughout the salad assembly. Use a serrated knife to cut 4-6 crusty rolls into 1″ cubes. Toss them in a bowl along with some olive oil, salt and pepper. 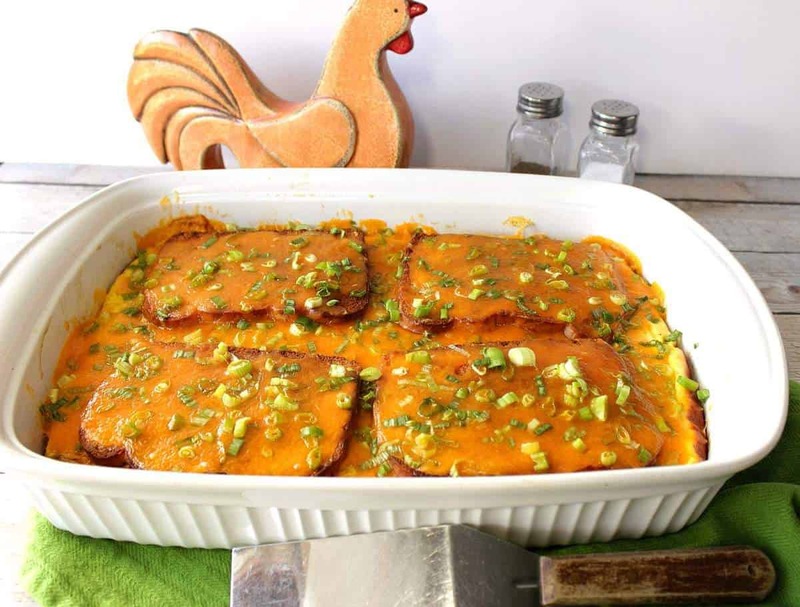 Lay the croutons in a single layer on a baking sheet and bake in a preheated 350 degree oven for 12-15 minutes (turning once), being careful to keep an eye on them so they don’t burn. Remove from the oven and cool. …halved tomatoes, chopped bacon, salt, pepper, Parmesan cheese, and the remainder of the homemade croutons. Cover the bowl with plastic wrap and chill until ready to serve with your favorite dressing. 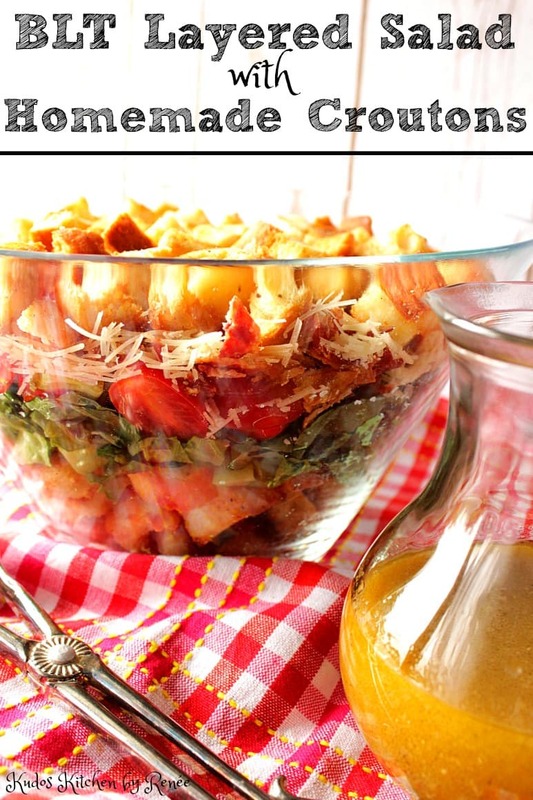 I’m sharing my recipe for homemade Dijon vinaigrette in the printable recipe below. 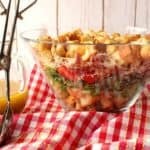 Everything you love about a BLT sandwich is in this BLT Layered Salad, including the toasted bread! 1 pound bacon cooked until crispy and then cut (or crumbled) into bite sized pieces. Toss the cut bread cubes in a large bowl with the olive oil, salt and pepper. Lay the bread cubes in an even layer on the baking sheet and bake in a preheated oven for 12-15 minutes (turning once) until golden brown. Remove the croutons from the oven and allow to cool completely. 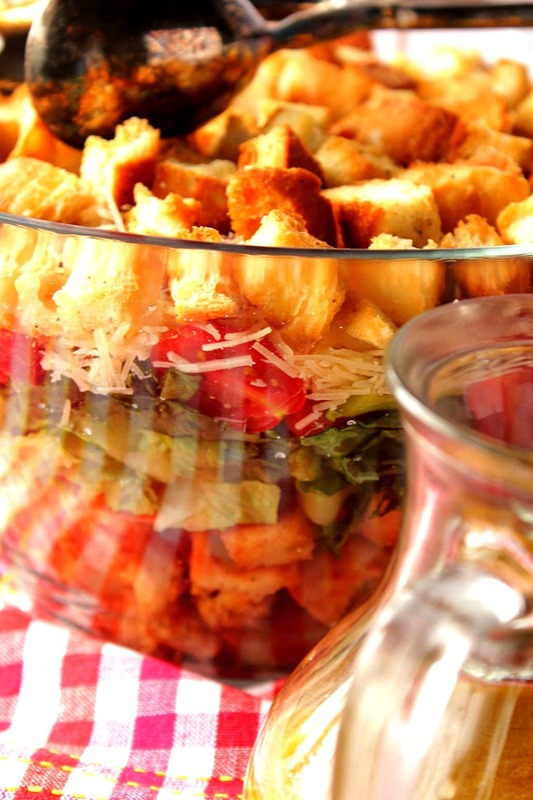 Layering the salad in the large, glass bowl, starting with a thick layer of cooled croutons. Continue layering with the lettuce, bacon, tomatoes and Parmesan cheese. Season the salad with salt and pepper if desired. Top the salad with the remainder of the homemade croutons. Cover the bowl with plastic wrap and chill until ready to serve. Add all ingredients in a mason jar, or jar with a tight fitting lid. Screw the lid on tightly and shake until the dressing is thoroughly combined. Serve with the BLT salad. This salad was a huge hit the day I served it, and even though a lot was eaten, I still had enough leftover to cover and eat the following two days for dinner. For me, that’s a huge plus on these dog days of summer when the last thing I feel like doing is heating up the kitchen to make dinner. 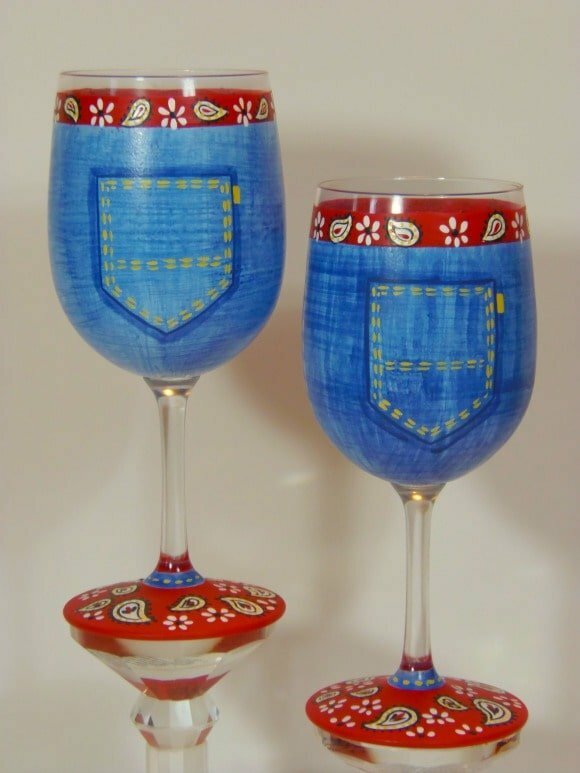 Now it’s time to relax, just a wee little bit before dinner, and what better way of doing so than with a nice glass (or two) of wine served out of these really cute Blue Jean Bandanna wine glasses? They’re casual and relaxed…Just like today’s recipe for BLT Layered Salad with Homemade Croutons. All of my hand painted glassware items are completely dishwasher safe as well as being non-toxic. Each piece comes in its own gift box making them perfect for gift giving. Items can be personalized at no extra charge upon request. Special orders are always welcomed. I will happily paint and design from any photo, idea, or description you send my way. Please don’t hesitate to email me: info@kudoskitchenbyrenee.com to discuss your design, or feel free to visit my shops: Etsy, Wazala, and Kudos Kitchen Paints. BLTs are always my go-to sandwich. Love that you’ve made it into a salad! Oh those homemade croutons – YUM! This salad has it all! 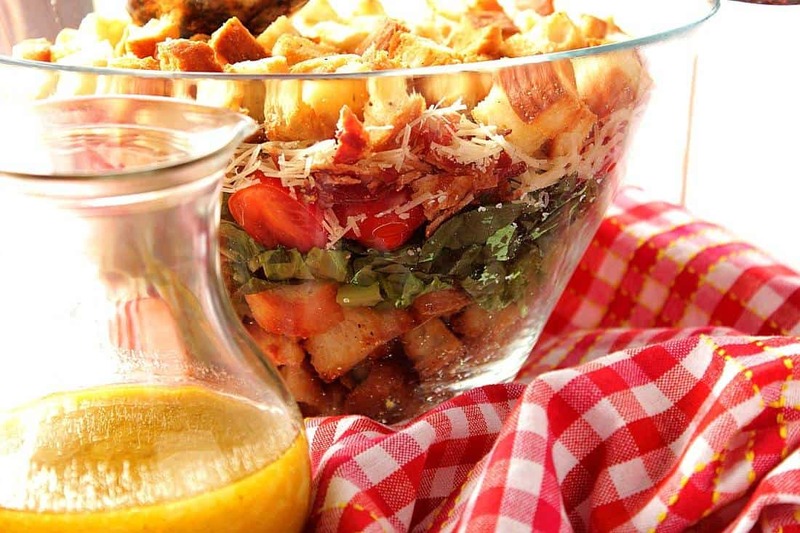 Now that is the perfect summer salad! I need to bring this to our summer BBQs. OMG this looks so good! I love homemade croutons! You had me when you made one of my favorite sandwiches into a salad, but adding homemade croutons?!?! Sign me up! 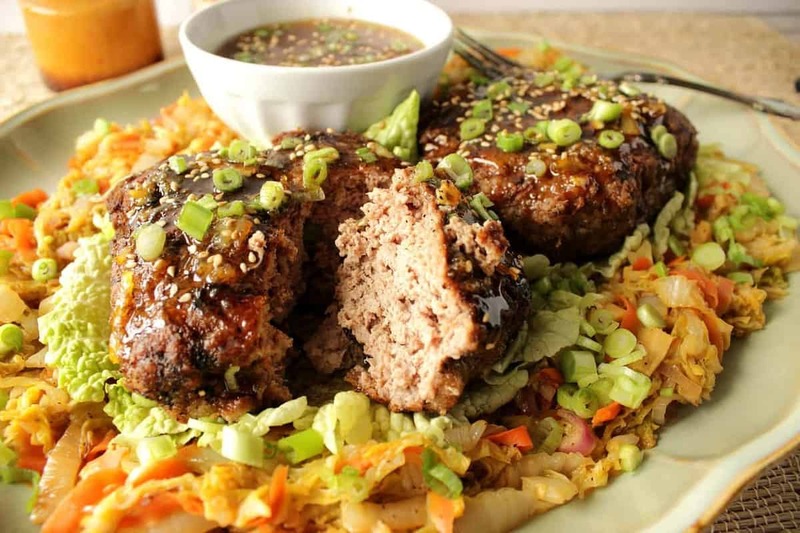 This looks like the sort of dish that would be devoured in seconds at a picnic! It’s so easy too. Thanks, Shelley! Love BLTs and handmade croutons sound wonderful!